Home to one of the largest oil refineries in the state, Richmond, California, was once a typical company town, dominated by Chevron. This largely nonwhite, working-class city of one hundred thousand suffered from poverty, pollution, and poorly funded public services. It had one of the highest homicide rates per capita in the country and a jobless rate twice the national average. But in 2012, when veteran labor reporter Steve Early moved from New England to Richmond, he discovered a city struggling to remake itself. 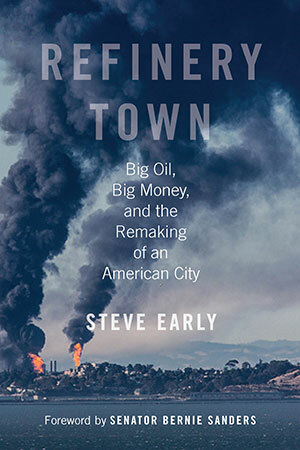 In Refinery Town, Early chronicles the fifteen years of successful community organizing that raised the local minimum wage, defeated a casino development project, challenged home foreclosures and evictions, and sought fair taxation of Big Oil. Here we meet a dynamic cast of characters—from ninety-four-year-old Betty Reid Soskin, the country’s oldest full-time national park ranger and witness to Richmond’s complex history; to Gayle McLaughlin, the Green mayor who challenged Chevron and won; to police chief Chris Magnus, who brought community policing to Richmond and is now one of America’s leading public safety reformers. Part urban history, part call to action, Refinery Town shows how concerned citizens can harness the power of local politics to reclaim their community and make municipal government a source of much-needed policy innovation.